Powered by 1 GHz NVIDIA Tegra 2 dual core processor & low power GeForce series graphics chip, Tablet S is well-built, sturdy and lightweight device. The tab comes in 16 GB and 32 GB memory sizes, priced at $499 and $599 respectively. 1 GB RAM has been provided for uninterrupted usage at high speeds. Android 4.0.3 System update is already available that will bring more features and enhancements to the tablet. Being the first of its kind, Sony tablet S can be comfortably held in one hand for longer duration whereas other tabs rely on accessories and cases to hold them. All thanks to Sony’s ideology of ‘Shifted Center of Gravity’. 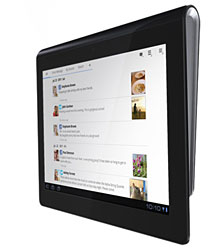 If comfort is what you look for, then, trust me you should blindly go with Sony S tab. Sony’s LED-lit TruBlack technology provides you with a beautiful display that offers anti-reflection and better contrast ratios too giving the tablet an extra edge in the image quality. The 9.4 inch 1280×800 pixels HD display is sharp and has very high viewing angles. 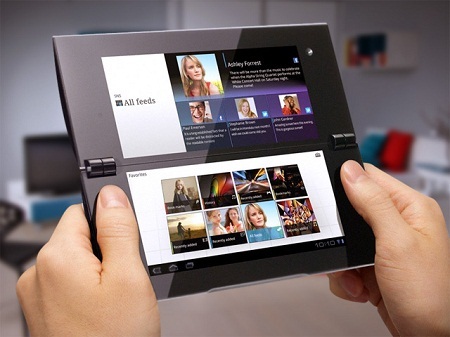 As far as design is considered the tablet has done extraordinarily well. The dual color construction gives it a unique look. The diagonally flowing silver lining has a shining effect that adds remarkably to its beauty. Android 4.0.3 Icecream Sandwich update ensures a smoother user experience. Swipe Technology works perfectly fine on the tab allowing user to type at speeds never experienced before. Software packs for Music, Video and Reader are pre-installed. PlayStation certification has also been provided that guarantees that Sony’s Android platform will suit to all games by PlayStation. Many games are preloaded with the device ensuring the Gaming fun. More apps can be added from different sources online. Wi-Fi, Bluetooth connectivity to enjoy the internet and transfer files wirelessly. One thing that was unusual was the lack of 3G and 4G connectivity via cellular network. 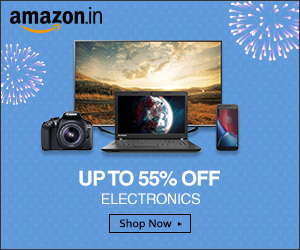 A 5MP rear shooter that offers decent quality images and a front facing (640 x 480) VGA camera has been attached with the device that is useful for Video Chatting. Lack of LED flash is a drawback while clicking images in dark. Video quality is quite good with 720p HD resolution that will capture your favorite moments. This time it is the charger and charging port that have been experimented and placed uniquely on the device. 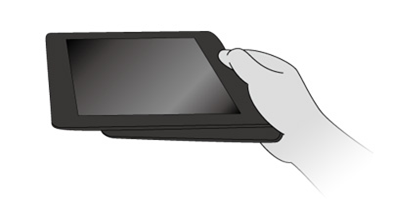 The tablet can be fully charged in 5 hours using its proprietary charger. While one can always use USB port to charge which takes a bit longer than the original proprietary charger. Depending on our settings and multi-tasking the battery life may vary. With a normal usage that involves watching a 2 hour movie, listening to music for an hour and browsing 2 hours, the battery lasts for about 7 hours that is quite remarkable. This was achieved while keeping brightness to 40% and turning wi-fi on only while browsing. The tablet can go a week without recharge which is pretty good. Unlimited multimedia can be relished with apps like Music Player, Media Player and YouTube. Sony promises “Entertainment ka Daily Dose” with its specially designed apps such as Videochaska, StarPlayer, Big Flix, BollywoodHungama.com and MeraGana.com. Videochaska – offers latest episodes of different shows from Sony and SAB TV in higher quality. Star Player – Offers Online Video on Demand service. Big Flix – It’s Movie on Demand app that makes full movies available in different languages and categories. First 2 months subscription is free especially for its Tab users. Websites such as BollywoodHungama.com and MeraGana.com are leading entertainment websites that offer latest Bollywood news and Indian music. To round off with Tablet S, I’d like to say that it is a multi-purpose tool packed with interesting and practical features with a little bit for every age group individual. Youngsters can enjoy their much-loved games with PlayStation. Games such as Crash Bandicoot and Pinball Heroes are provided free and many more can be downloaded online. Email, Evernote and Social Feed Reader are available for Students and professionals. Social Feed Reader allows viewing of pre-selected social media posts, keeping readers updated about their interests. Sony’s undistinguished past in Electronics industry and its great customer service is surely going to be an add-on to its fresh Tablet bazaar. Undoubtedly, Sony is going to make much money and take away all the prizes in the profitable Tab market.